Of all the worlds’ legendary characters, few have attracted world-wide fascination like the outlaw, Jesse James. Some call him America’s Robin Hood, while others see him as a cold-blooded killer. Perhaps he was all of these things. Jesse Woodson James was born in Kearney, Missouri on September 5, 1847. His father, the Rev. Robert James, was a Baptist minister who helped found William Jewell College in Liberty, Mo. Some people say it was the cruel treatment from Union soldiers that turned Frank and Jesse to a life of crime during the Civil War. Certainly during the war years they learned to kill while riding with William Quantrill and Bloody Bill Anderson. After the war, Jesse was wounded while surrendering. It was his cousin, Zee, who nursed him back to health. Jesse married Zee after a nine-year courtship. She was named after his mother, Zerelda, and he called her Zee for short. They had two children, Jesse Edwards and Mary. Within a year, Frank and Jesse are believed to have pulled off the first daylight bank-robbery in peace time. They made off with $60,000 from the Liberty, Mo. bank not far from their home, and one man was killed. For the next 15 years, the James boys roamed throughout the U.S. robbing trains and banks of their gold, building a legend that was to live more than a century after Jesse’s death. The Pinkerton Detective Agency was called in to help catch the famous desperadoes. Once during a nighttime raid on the family home outside Kearney, Mo., a firebomb was tossed into the log cabin. When it exploded, it tore off the hand of Jesse’s mother, and led to the death of his half-brother Archie. Jesse reached his Waterloo in September, 1876, when his gang, including the Younger brothers, took on the bank at Northfield, Minn. Within minutes the town people returned fire. All except Frank and Jesse were either killed or were wounded and captured. Frank James also married, and their wives tried to get them to take on a more normal life. With a $10,000 reward on his head, Jesse moved to St. Joseph, Mo., with his family in the fall of 1881 to hide out from the law. After a brief stay in another house in St. Joseph, it was on Christmas Eve that Jesse and Zee moved their final family home atop a high hill overlooking St. Joseph. Living under the assumed name of Tom Howard, Jesse rented the house from a city councilman for $14 a month. He attended church, but did not work for a living. During the winter of 1882, Jesse tried to buy a small farm in Nebraska. But in April, he was short of cash. All of his earlier gang members were either dead or in prison, but Jesse recruited Bob and Charlie Ford to help him rob the Platte City bank. 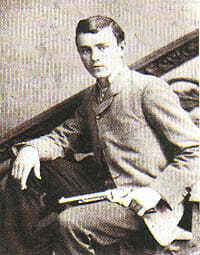 The Ford brothers posed as cousins of Jesse James, but actually were not related to Jesse at all. The $10,000 reward on Jesse proved too appealing to the Brothers. While Jesse stood unarmed on a chair in the family home in St. Joseph to dust and straighten a picture, Bob and Charlie Ford drew their guns. 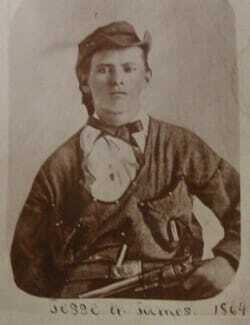 Bob Ford put an end to the James legend with a single bullet to the back of Jesse’s head on April 3, 1882. Jesse was 34 years old. After the shooting, Jesse’s wife and two children and his mother, Mrs. Zerelda Samuel, spent the next two nights at Patee (Pay-Tee) House, which was then called the World’s Hotel. The hotel also became the center of investigation location due to its close proximity to the house, located at 1318 Lafayette Street. It is now an amazing historical museum giving a glimpse of St. Joseph and the 1850-1930 time period. 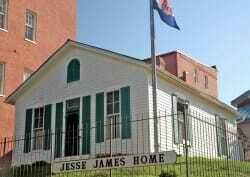 The Jesse James Museum is a non-profit museum, focused the life and death of Jesse James. In 1995 forensic scientist James Starrs exhumed the outlaw’s body at Kearney, MO, for DNA tests. The results showed a 99.7% certainty that it was Jesse James who was killed in St. Joseph in 1882. Artifacts from the grave are now on display including the coffin handles; a small tie pin Jesse James was wearing the day he was killed; a bullet removed from his right lung area; and a casting of his skull, showing the bullet hole behind his right ear. The James Home was originally located about two blocks north of its present location, on Lafayette Street, on a high hill overlooking Patee House. 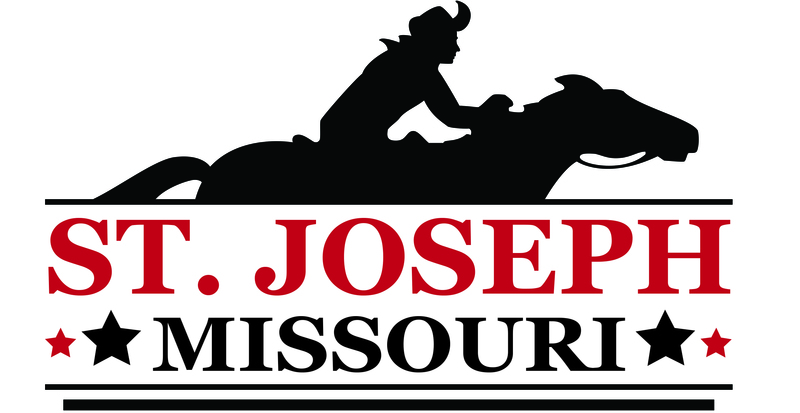 In 1939, it was moved to the Belt Highway in St. Joseph as a tourist attraction.  The Jesse James Museum and Patee House Museum is operated by the Pony Express Historical Association with all proceeds from admission charges going to help maintain both the Patee House Museum and the Jesse James Home. The Ford brothers attempted to collect the reward. Instead, they were charged with murder. They were sentenced to hang, but were pardoned by Governor Tom Crittenden. The courtroom judges bench that the Ford Brothers stood before during their trial still remains in the Buchanan County Courthouse. Two years after the assassination, Charles Ford committed suicide and Bob Ford, the “dirty little coward who shot Mr. Howard, and laid poor Jesse in his grave,” was himself killed in a bar room brawl in Creede, Colorado, in 1892. 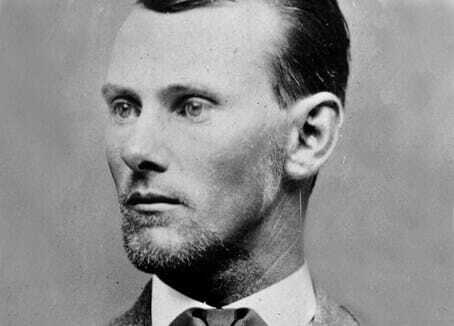 Jesse’s brother Frank James gave himself up a few months after the assassination. He was tried for murder in Missouri and found not guilty, tried for robbery in Alabama and found not guilty, and finally tried for armed robbery in Missouri and again released. A free man, he retired to a quiet life on his family’s farm, dying in 1915 in the room in which he was born. In 2007, Warner Bros produced “The Assassination of Jesse James by the Coward Robert Ford”, starring Brad Pitt as Jesse James and Casey Affleck as Robert Ford.